The AdderView CATx AVX1016 is an 16-port secure KVM via CATx switch that provides local and remote access for a user that wishes to control up to 16 multi-platform servers. A 'plug-and-play', half width1U appliance, the AdderView AVX1016 is a self-contained system that installs in minutes combining high security, flexibility, integrated power control, faultless video quality and CD quality audio. One local user or one extended remote user can control up to 16 multi-platform servers. Up to 16 different user profiles can be stored with access rights for each user defined. The AdderView CATx 1000 provides exceptionally high video performance to local and remote extended users alike, supporting up to 1900x1440 resolutions (1600x1200 on remote links) with DDC emulation which is further enhanced by DC balancing to ensure full and true color. Flash upgradeable CAMs are available for VGA and DisplayPort video + PS/2, USB and Sun keyboard and mouse support with optional audio. KVM communication from switch to target devices can be up to 10m (33ft). The AdderView AVX1016 can be controlled by a user from up to 985ft (300m) away over CATx cable using the AdderLink X200 or X100 receiver and the integrated CATx extender. The AdderView CATx 1000 switches support any computer platforms with PS/2, USB and Sun keyboard and mouse interfaces. Country code reporting, DDC and continuous keyboard and mouse emulation ensure faultless operation. AdderView CATx 1000 switches support CD quality 44.1kHz digital stereo audio when optional audio enabled CAM modules are used. The AdderView AVX1016 can be switched using selectable keyboard hotkeys, an on-screen-display (OSD), 3 button mice, or with ASCII codes via serial RS233. These switching options allow you to rapidly reassign connected devices to any of the connected computers. Expand simply by using just CATx cable to link units. The AdderView automatically detects cascade connections to support up to 512 computers. Supported Software Operates with all known software and operating systems including Windows (all); DOS; Linux, Unix, BSD; all Sun OS; all Mac OS; NetWare, etc. Other connectors Network/IP: RJ45 10/100 autosensing (IP version only), DB9 female for flash upgrade, syncing boxes and other special functions. DB9 male for RS232 triggered power switches. DB9 Male (AdderView CATxIP only) for modem connection. AVX1016 is also known as the AVX1016-US and AVX1016-USA. Question: Will the Options serial input work with a mechanical switch? I.e a toggle/rocker switch connected by RS232 serial to Options which switches between two CAT5 inputs? The AVX1016 switch does not support a mechanical switch. 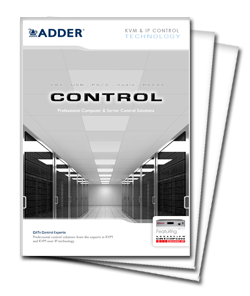 Adders' AV4PRO switches support channel selections using dry contact/open collector style devices. Question: What is the End of Sale / End of Maintanace date for this product? According to Adder, AVX1016 is a fully active part number and has no plans for being set on End-Of-Sale / Discontinued soon. Maintenance for the unit would be supported, at the very least, for the length of the warranty.